SUB-SLAB DEPRESSUIZATION: Suction created in a pit excavated under the slab. DRAIN TILE DEPRESSURIZATION: Suction created in or next to drain tile - extends under the floor via drain tile or aggregate. SUMP DEPRESSURIZATION: Suction created in groundwater drainage sump - extends under floor via drain tile or aggregate. BASEBOARD DEPRESSURIZATION (NOT COMMON): Suction crated in wall - floor joint and, if any, adjacent masonry wall. SUB-MEMBRANE DEPRESSURIZATION: Suction created under a membrane such as plastic or rubber, placed on exposed soil and or rock (Crawlspace). BLOCK WALL DEPRESSURIZATION (NOT COMMON): Suction created in concrete block wall. SUBSLAB PRESSURIZATION: Used when sub slab is permeable. These systems will increase heating costs. 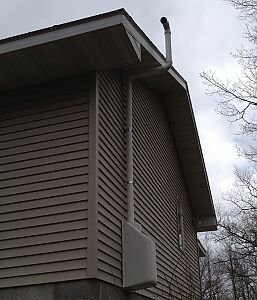 The fan is used in reverse - blowing air into the sub floor. First floor air is blown into the lower level sub floor. (Not used often). SEALING THE CRACKS IN BASEMENT FLOOR: Using caulking to prevent radon from entry to basement. Also involves sealing all sump crocks. INSTALLING A HEAT RECOVERY VENTILATORS (HRV's): Exchanging build air (outdoor/indoor air). This is done by diluting the indoor air supply with outdoor air.